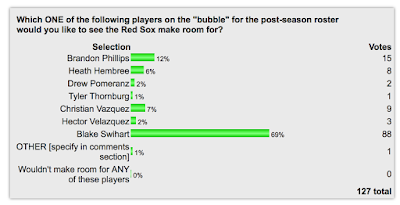 Further voting in our latest FenwayNation Poll shows that Blake Swihart continues to garner huge support as the Red Sox player "on the bubble" who most deserves a spot on the post-season roster. 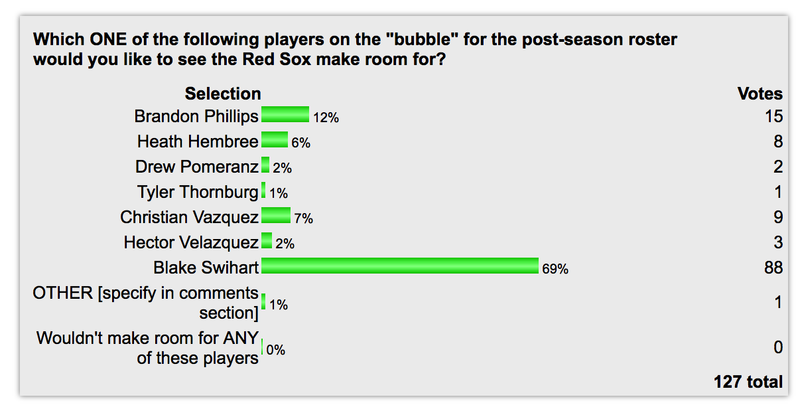 As the chart shows, almost seven readers in ten (69%) choose Swihart—followed distantly by Brandon Phillips at 12%. Next in the ranking for "most deserving of promotion" are: Christian Vazquez (7%), followed by Heath Hembree (6%), Hector Velazquez (2%), Drew Pomeranz (2%) and Tyler Thornburg at 1%. One reader "wrote-in" Brian Johnson for promotion to the playoff roster. No readers selected the option saying that none of these players were worthy of a boost to the post-season. You can still vote in the poll HERE.